Okay, so you’re having a new yacht or built — or perhaps planning a major refit and repowering project. And you’re naturally considering not only which engine make and model to choose but which selection of power rating to make. Well, you might be surprised to learn that much of the common wisdom about fuel consumption and operational efficiency as they relate to horsepower ratings is misinformed or misguided. 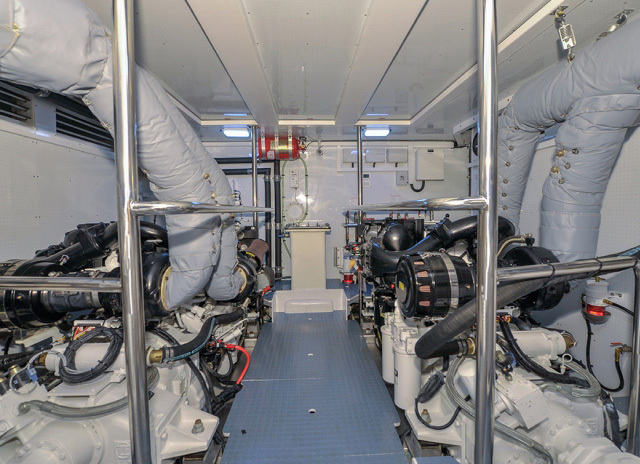 Contrary to common old wives’ tales accepted by many in the marine industry, fuel consumption is directly related not to engine “size” or HP-rating, but to the actual power produced. An internal combustion engine produces power only in response to a load. All other factors held constant, an engine with a higher HP-rating will not produce any more power than one with a lower HP-rating, when both engines are faced with identical loads — provided only that each engine is sufficiently powerful to adequately respond to the load in question. Horsepower is a measure of work accomplished. As such, it is the product of torque (force) and engine rpm (movement). Torque is produced by combustive force in an engine’s cylinders acting through its chain of pistons, connecting rods and crankshaft. Assuming similarly efficient fuel burn between different engines (a reasonable assumption in most cases), combustive force is determined by the quantity of fuel burned. And the quantity of fuel burned is proportional to the load being placed on the engine, not on the size or HP-rating of the engine itself — nor on engine rpm, since maximum governed rpm can be reached with very little fuel burn if a load is not placed on the engine (e.g., running in neutral). The upshot is that for a given load — or we may say, for a given application in a specific vessel — the actual fuel consumption of two engines with different HP-ratings under equal load conditions will be effectively the same. Moreover, in terms of fuel consumption and range, choosing an engine with a lower HP rating may not really be advantageous. Granted, it is likely that, of two engines able to handle a given anticipated load, the one with the lower HP-rating will have a lower first cost. If your anticipated load dictates a 500 HP engine, selecting one of similar weight, but with a maximum 700 HP rating will probably cost more initially — although not ultimately in terms of fuel consumption, maintenance, or longevity. A proper analysis requires consideration of the effect of maximum HP-rating on longevity or MTBF (mean time between failure). For example, if you run an engine consistently for long periods of time at 95% to 100% of its rated horsepower output, you are almost certainly going to seriously reduce its operating life. Consequently, the idea is to select an engine or engines with power ratings that assure the bulk of your operating hours will be at 80% to 85%, or less of maximum rated output. By decreasing the percentage of operating hours at engine loadings above 85% or maximum rated output, you almost always increase MTBF, and will as a result reduce the ultimate cost per hour of running time of your engine(s). Yes, the above photo comparison is a joke. However, it’s intended to make a serious point. In the case of pleasure craft, you should keep in mind that no vessel ever loses weight as it ages. What we refer to in the industry as “weight gain” is a never-ending, never-reversing process that begins when the vessel moves from design and engineering to actual construction, then to outfitting and commissioning, and finally to, and during real-world use, when all the detritus of cruising flows aboard… jet skis and other water toys, diving and fishing gear, and the like. A yacht’s life cycle is always — yes always — accompanied by a growth in overall, loaded weight. The result is an increasing load for propulsion engines to face over the life of the vessel. All due to the fact we always put things onto and into a yacht — but we rarely, if ever take anything off. If the engines you select start out life in an application initially projected to load them to 90% or more of their rated power, you can almost certainly expect that somewhere during their life in the yacht in question, they will end up running overloaded, that is, producing power at levels above their rated allowable maximum. This will mean accelerated stress, wear and tear; decreased MTBF; and ultimately higher cost per hour of running time than if you had specified and initially paid for engines with a higher power-rating. However, that’s not the only problem with engines whose horsepower ratings are only marginal for the application at hand. My experience in large-yacht construction is that a significant number of such vessels even end up under-powered for their performance targets by the time their construction is completed and they are launched. As construction and final engineering progress during a new-build, previously unanticipated weight growth may force the acceptance of lower vessel performance than originally targeted — unless you take remedial action along the way. And inevitably, when there is a possibility of this eventuality, it is better to take counter measures while the build is still in process. For example, one might be able to boost projected thrust by up-sizing the vessel’s propellers. However, because of the higher loading produced by such larger propellers, this kind of move will only be successful if the engines selected at the early stages of project development and specification have a sufficient margin of reserve power available to accommodate the higher propeller loading. It’s inherently controversial for me to say this, but in my experience as a yacht builder, I’ve found it prudent to select engines whose power production ratings are 10% to 25% higher than the designing naval architects and engineers originally anticipated would be necessary. Of course, you need to ensure that the overall weight of the higher-powered engines is not significantly greater than the weight of those originally specified. (In most cases, it won’t be.) And you have to ensure that the higher-powered engines fit within the maximum physical envelope delineated in the design when the original engines were chosen. However, if these parameters can be met, you can provide for a margin of reserve power, without incurring and penalties in terms of fuel consumption and range. In other words, if it turns out the additional power is not required, the vessel will not be carrying around any excessive additional weight, nor will the higher-powered engines be using any more fuel than would have been used by the lower-powered engines originally specified. Finally, a bonus will be that the engines with the higher power ratings, when run at a lower percentage of rated maximum power, may also last longer, be more reliable, and run a lower risk of violating the terms and conditions of their warranties.